Buyers love to tell their suppliers that what they are offering is exactly the same as what they can buy from other vendors. This is usually a ruse to drive prices lower knowing that the b2b supplier is fearful of losing the business. We call this the “commodity trap”. It is feared by all business to business companies. In fact, many believe that they are already in it. In this white paper we advance the argument that there is no such thing as a commodity in business to business markets. The fact that a buyer says that all suppliers are the same is a fallacy. For a start, the name of your company is different to that of other suppliers and with it goes your reputation – a reputation for reliable products, reliable service, and speed of response when it is necessary. Your product or service is almost certainly made in a different location to that of your competitors and this in itself may make you special. The people who represent your company are different to the people who represent your competitors. Everything about your company adds up to it being unique. The only thing that could commoditize the market is the failure of a supplier to recognise these differences and fall into the trap of lowering its prices, not knowing what else to do. In order to counteract buyers who seek to commoditize their suppliers, a b2b company has to find ways other than lowering its prices to differentiate its offering. differentiate by delivering exceptional customer experience. The term customer value proposition (or CVP) is widely used to refer to a company’s “offer”. A few years ago marketers used the term “unique selling proposition” but this is now considered restrictive as there may be many features within an offer that customers value and not all are necessarily unique. A customer value proposition needs careful thought as it must resonate with potential customers such that they can find a strong justification for buying the product. Developing a strong customer value proposition requires a deep understanding of customers’ needs. 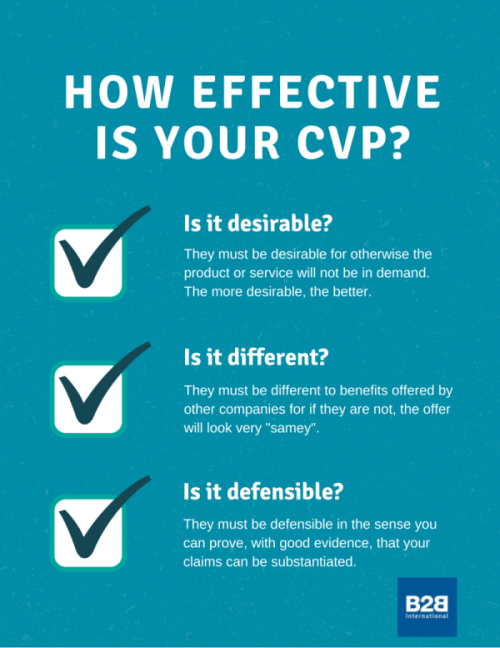 When starting to think about your CVP, it is worthwhile writing a list of all the benefits your offer could provide to customers. It goes without saying that these benefits should be meaningful to customers. There is little point saying “our product safety is guaranteed because our manufacturing process is certified according to ISO 9000” if this is strongly promoted by every other supplier. However, if other suppliers have ISO 9000 but do not talk about it (and especially if they don’t have it) this benefit could be yours to own. A powerful CVP requires knowledge of how your offer delivers superior value and for this you must explore customers’ needs. Customers are diverse, ranging from small to large organizations, operating in different industry verticals and located in different regions and countries. Any sample of companies interviewed should be large enough to cover a cross section of the market place and show if there are groups of customers with different or similar needs. It should be possible to customize your offer around the needs (or un-met needs) of those segments. 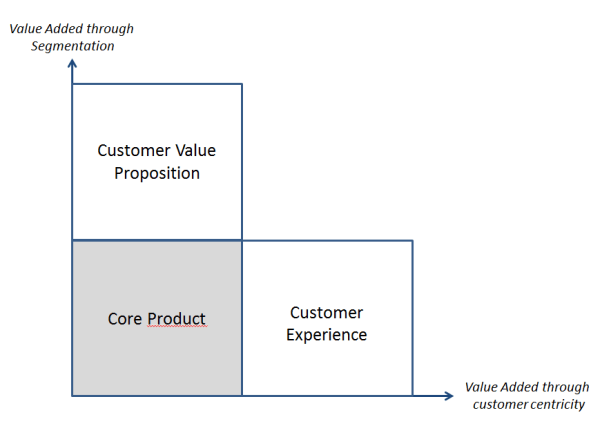 In other words a customer value proposition is required for each segment. Your CVP must contain elements that really matter to target customers and are considered by them to be desirable. Moreover the superiority of your offer has to be substantiated in terms of actual value. A proposition that says “we help you save money” has been heard too often and will not be valued unless it is defended by solid evidence. Additionally, if the benefits can be seen to be different and distinctive from those of competitors, you will have built yourself an effective customer value proposition! It is much easier to copy a product and make it look similar to others than it is to copy the service that accompanies the product. The very fact that service is delivered by people in a personalized way makes it unique. Furthermore, service is highly valued. People remember good service long after they have forgotten the price of whatever they have purchased. Providing excellent customer service and experience is critical in avoiding the commodity trap. In fact, the idea of “customer experience” goes beyond “good service”. It is based on the concept of a culture and the mind-set of an organisation. It is underpinned by an ambition to provide a holistic experience to each customer. It is a serious attempt to reach the emotions of the customer at different touch points in their dealings with a supplier. All products are accompanied by some level of experience and service. A customer who calls a company will be introduced to the experience of speaking to a receptionist (and hopefully not a recorded message). A customer travelling on the highway may see a truck emblazed with a company name and in its livery. The condition of the vehicle will leave an impression. Customers receive emails in which words and images communicate the type of company that has sent it. All these touch points constitute an experience for customers which will in some way influence their attitudes to potential suppliers. Quite clearly, positive experiences will ensure that you do not fall into the commodity trap. British Sugar is one of the largest suppliers of sweeteners in Europe. It worked hard to win a customer in Northern Ireland. On the morning of the first bulk delivery a young woman accompanied the blue British Sugar truck as it drove into the customer’s plant. She introduced herself as a customer service representative and explained that although the customer may never see her again, she would always be at the end of a phone to solve problems should they arise. She had made the trip to meet the customer especially to make this point and the customer never forgot it. An excellent customer experience program never stops. It will keep your organisation striving for best-in-class all the time. Furthermore, in case the customers’ requirements change, as surely they will over time, your customer experience offer can change too. Today’s wow factor might be tomorrow’s hygiene factor. It is obvious that this status is difficult to reach for a supplier and it requires hard work from the whole organisation. Great customer experience is hard earned. It is earned in small servings, over time. But it is worth the effort because it provides strong differentiation from the competition even if the core product is considered similar. As with the development of a customer value proposition, a customer experience offer should be based on thorough voice-of-the-customer research. 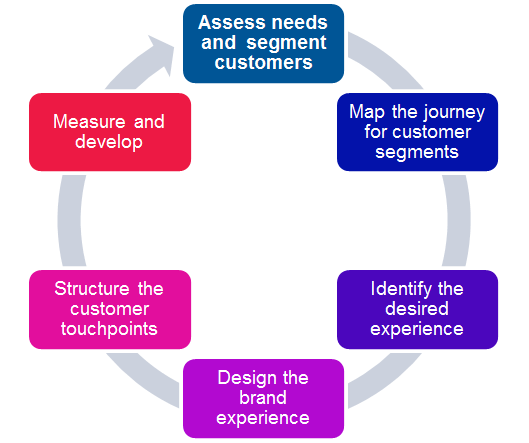 Start by mapping the customer journey so that all touch points can be identified. Consider carrying out customer interviews to understand the desired experience. Based on the insights you gain from this, you will be able to design the ideal brand experience and take adequate actions in order to re-structure the touchpoints. Both CVP development and customer experience programs need constant reviews to take account of the inevitable changes in market sentiment. Depending on the number of customers in your database such tracking studies can vary from a quick “How are we doing?” tracker every 2 or 3 months, to a more substantial annual or bi-annual strategic relationship survey. A key element to successful CVP development and customer experience programs is the buy-in from management. It is from here that the new culture starts and from where it will be diffused into the organisation. Developing a customer value proposition and / or starting a customer experience program are not the only strategies for fighting commoditization, but they are two useful starting points. Both can be realized without drastic interventions in a company’s organisation. All they require is carefully listening to customers, understanding their needs and turning insights into action! Both offer value-added for customers. An effective CVP delivers savings; customer experience excellence delivers emotional value-added to the customer. Both are designed to stop the drift into the commodity trap and defend margins.